July 22nd, 2009. 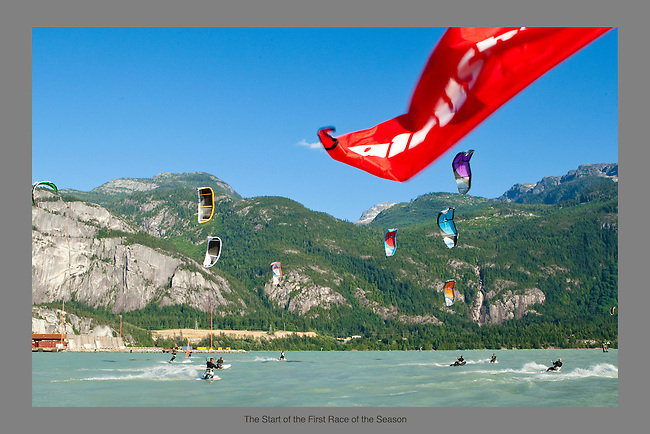 The red flag indicates the start of the first race of the 2009 SWS Kiteboard Race Series. Kiteboarders jockey for position while waiting for the race to begin. They must circle back and forth behind the start line until a blast from a horn sounds and the red flag is flown. It is advantageous for them to position themselves correctly so they are at the start line the moment the race begins. Squamish, BC. Photo by Gus Curtis.